High-quality education from 2 years to 13 years. Dear families, Happy Summer! Things are moving along as we prepare for another exciting and educational school year at St. Brigid School. The following pages contain some important information for families of children entering the Nursery Program. Please contact Ms. Jackie Delucia with any startof-year questions at JDelucia@StBrigidSchoolNY.com. The following pages provide you with important information for families of children entering PreK 3 this September. Please contact Ms. Jackie Delucia with any start-of-year questions at JDelucia@StBrigidSchoolNY.com. We are excited to welcome our new and returning child/ren and families to our PreK For All program this September! 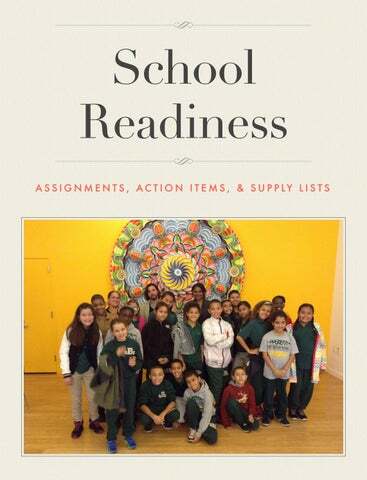 The following pages provides you with important information for families of children entering PreK 4/ PreK For All. Please contact Ms. Jackie Delucia with any start-of-year questions at JDelucia@StBrigidSchoolNY.com. We are excited to welcome our new and returning child/ren and families to our Kindergarten program this September! The following pages provides you with important information for families of children entering Kindergarten. Please contact Mr. Hernon with any start-of-year questions at SHernon@StBrigidSchoolNY.com. We are excited to welcome our new and returning child/ren and families to our 1st Grade class this September! The following pages provides you with important information for families of children entering 1st Grade. Please contact Mr. Hernon with any start-of-year questions at SHernon@StBrigidSchoolNY.com. 2) Practice letter recognition and sounds. We are excited to welcome our new and returning child/ren and families to our 2nd Grade class this September! The following pages provides you with important information for families of children entering 2nd Grade. Please contact Mr. Hernon with any start-of-year questions at SHernon@StBrigidSchoolNY.com. listing is a minimal list of items to be purchased outside the tuition and fees. Please bring these items on the first day of class. Student’s Personal Items (labeled with student’s first & last name) _____ 1 backpack (without wheels) _____ 2 composition notebooks (labeled with your child’s name) _____ 2 folders with pockets (labeled with your child’s name) _____ Sharpened Pencils Summer Work 1) At St. Brigid School, we believe the best thing that children can do over the summer is to continue to read, and continue to develop a love of reading. We would love for you, or your child, to read as many books as possible over the summer, but every student entering grade 2 must read both books from the list below: - Flat Stanley: His Original Adventure by Jeff Brown - Junie B, 1st Graders at Last! by Barbara Park Please read the book over the summer (read it with your child if that's appropriate for his/her age), and have it ready for the first day of school. Please complete a book report for both books. Follow format provided. Children are permitted to read all the books for their class if they would like, however they can only participate in one book club (to keep the clubs small). 2) Review letter sounds. 3) Review addition and subtraction within 20. We are excited to welcome our new and returning child/ren and families to our 3rd Grade class this September! The following pages provides you with important information for families of children entering 3rd Grade. Please contact Mr. Hernon with any start-of-year questions at SHernon@StBrigidSchoolNY.com. We are excited to welcome our new and returning child/ren and families to our 4th Grade class this September! The following pages provides you with important information for families of children entering 4th Grade. Please contact Mr. Hernon with any start-of-year questions at SHernon@StBrigidSchoolNY.com. We are excited to welcome our new and returning child/ren and families to our 5th Grade class this September! The following pages provides you with important information for families of children entering 5th Grade. Please contact Mr. Hernon with any start-of-year questions at SHernon@StBrigidSchoolNY.com. Supplies St. Brigid School strives to provide an experience for your family where all necessary materials for your child/ren is provided through tuition and fees. The below listing is a minimal list of items to be purchased outside the tuition and fees. Please bring these items on the first day of class. Student’s Items (labeled with student’s first & last name): _____ 1 backpack (preferably with no wheels) _____ 7 Marble notebooks _____ 4 folders Summer Work _____ 1. Book Club At St. Brigid School, we believe the best thing that children can do over the summer is to continue to read, and continue to develop a love of reading. In order to provide students with some framework for what to read and to show that all of us need to read, we are establishing a book club model of summer reading. We would love for you, or your child, to read as many books as possible over the summer, but every student entering grade 5 must choose one book from the list below: - When You Reach Me by Rebeca Stead - Number the Stars by Lois Lowry Please read the book over the summer (read it with your child if that's appropriate for his/her age), and have it ready for the first day of school. In the first weeks of school, the book clubs will meet with their teacher or staff member who chose the book for a book club session to discuss the book. Children are permitted to read all the books for their class if they would like, however they can only participate in one book club (to keep the clubs small). _____ 2. Summer Memories Poster You will get a chance to share a summer memories poster with your classmates on the first day of school. This is your chance to share your favorite summer memories and learn about your new classmates. I hope you have fun making your poster. I can’t wait for you to share all the exciting events you participated in over the summer! _____ 3. Reading A to Z Encourage your child to read all summer! 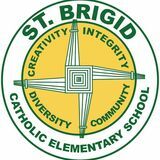 St. Brigid School has a subscription to www.raz-kids.com, which allows your child to access an online library of reading materials from any computer connected to the Internet. Raz-Kids helps students improve their reading skills as they listen to a book read for modeled fluency. If the computer has a built-in record function, they can record themselves reading the same book. Or, students can read the book to themselves or aloud for practice. Interactive quizzes are available at the end of each book to check for understanding. Here is how to access the website and your child’s reading assignment from any computer connected to the Internet: 1. Go to www.raz-kids.com from your Internet browser and click on LOG IN. 2. Type in the teacher’s username and click GO. 3. Find your name or symbol on the chart and click on that symbol. 4. Enter a picture password if prompted. 5. The books in your child’s assignment and stars earned appear on a personal assignment page. Your child can choose to listen, read, or take a quiz by clicking on the symbols below each book. We are excited to welcome our new and returning child/ren and families to our Middle School classes this September! The following pages provides you with important information for families of children entering Middle School. Please contact Mr. Hernon with any start-of-year questions at SHernon@StBrigidSchoolNY.com. - I Am Malala: The Girl Who Stood Up for Education and was Shot by the Taliban by Malala Yousefzai - The Giver, Book 1 by Lois Lowry Entering 8th Grade - A Tree Grows in Brooklyn by Betty Smith - Outliers: The Story of Success by Malcolm Gladwell Please read the book over the summer and have it ready for the first day of school. Students are permitted to read all the books for their class if they would like.